The WinSMS E-mail to SMS Gateway allows one to send e-mails which are then converted to SMS messages. If you are using Microsoft Outlook version 2007 or 2010 please click here for detailed instructions on how to set up the Outlook Mobile Service. Please note that the e-mail to SMS gateway should not be used for sending large batches of messages (greater than 1000 at a time). If you need to send messages in bulk then please use the WinSMS Desktop Client Software or our online bulk SMS portal at WinSMS.mobi. In order to use the E-mail to SMS gateway you must have an account with WinSMS. If you do not have an account, please click here to register. Subject Authentication – You include your WinSMS username and password in the Subject of the e-mail. Sender Address Authentication – You specify the e-mail addresses from which you want to be able to send e-mail to SMS messages. The username and password must be separated by a comma, and must be enclosed by a hash #. The gateway will send the first 160 characters of the e-mail as the SMS message, but if you have enabled long messages under “My Profile” in the client zone, it will send the first 918 characters of the e-mail. In this example the message will be scheduled for 27th November 2015 at 15:00 (3PM). To view or download your logs of sent messages just login to the Client Zone (here) and go to “Logs”. To be able to use Sender Address Authentication you must first specify which e-mail addresses can be used for authentication. 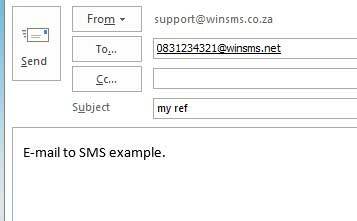 Once you have done this you will be able to send to cellnumber@winsms.net without putting your username and password in the subject. The username and password is NOT required in the subject. The subject can be used for any personal reference and it won’t appear in the SMS that gets sent. The gateway will send the first 160 characters of the e-mail as the SMS message, but if you have enabled long messages under My Profile in the client zone, it will send the first 918 characters of the e-mail. If you have any questions or need any assistance please contact support here or give us a call during office hours on 0861WINSMS (0861 94 6767).